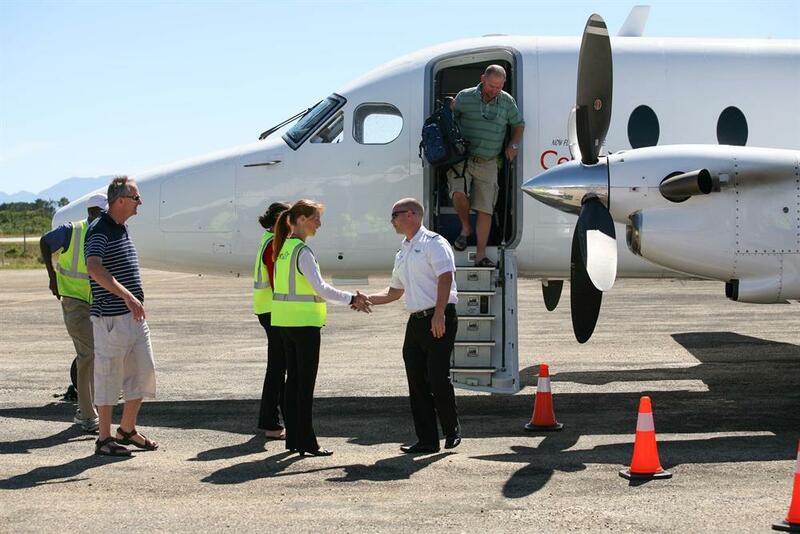 Aircraft owner and operator CemAir launched the first scheduled flights between Plett and two major city centres just over a year ago and since has seen more than 9 000 passengers make use of the service. Photo: Ewald Stander. PLETTENBERG BAY NEWS - Direct flights to and from Plettenberg Bay has brought with it a boost of more than R50-million to local businesses over the past year. Aircraft owner and operator CemAir launched the first scheduled flights between the popular holiday destination and two major city centres just over a year ago and since has seen more than 9 000 passengers make use of the service. Bitou executive mayor Memory Booysen said this equated to an estimated R56-million boost to local economy. CemAir chief financial officer Laura van der Molen said that after initial market research revealed that there was a major demand for flights to and from Plettenberg Bay, Johannesburg and especially Cape Town, they decided last year in March to launch scheduled flights on Fridays, Saturdays and Sundays between Plett and the two cities. “In line with passenger feedback within the first year, the schedule was enhanced to include Wednesdays and Thursdays as well as a Monday morning flight to Johannesburg. In total the schedule currently runs five days a week. The passenger loads are still very seasonal, however there is steady growth in the demand for out-of-season business travel during the week,” Van der Molen said. Van der Molen said the current achievements and future expansion of such a service relied heavily on the support from the community and the Bitou Municipality. CemAir’s presence at the Plettenberg Bay Airport is however more than just tourism stimulation, but also about skills development. The local fire department recently received fire training to bring local personnel up to qualifications required to provide adequate aviation emergency response. The airport, which is owned and managed by the municipality, has also recently been upgraded with the installation of Jet A1 fuel and Avgas fuel tanks by Air BP. Booysen said future fuel sales at the airport are forecast at 20 000 litres per month. Van der Molen said the airport had also recently been awarded a category four rating for its firefighting services by South African Civil Aviation Authority. “This is a significant achievement elevating the airport to one of the very few non-Airports Company South Africa (Acsa) controlled airports in the country to achieve such a rating. CemAir also has several plans in the pipeline for Plettenberg Bay, including to build the route and expand the offering in line with customer demand. In March this year, CemAir also purchased a fire truck from Acsa in George. The vehicle is currently based at the Plett Airport. The relationship CemAir and the Bitou Municipality promises to continue it upward trajectory. Photo: Ewald Stander. Bitou firefighters recently received fire training at the Plett Airport. to get the qualifications required to provide adequate aviation emergency response. CemAir sponsored the training of eight firefighters. Photo: Ewald Stander. CemAir chief financial officer Laura van der Molen. Photo: Ewald Stander. ARTICLE: YOLANDé STANDER, KNYSNA-PLETT HERALD CORRESPONDENT.